Just like real airplanes, the Jet Spring Rider is constructed with heavy duty sheet plastic. Featuring specially cut panels to mimic all the details of an airplane, this spring rider is perfect for aviation themed parks and brings out the pilot and co-pilot in all children. 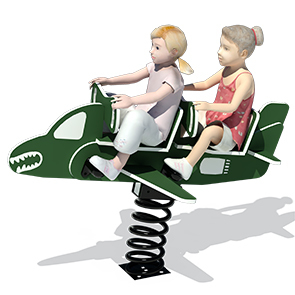 Perfect for children ranging from ages 2 through 5, the Jet Spring Rider is seats two comfortably, encouraging social interaction at an early age. Virtually maintenance free and available in the color options shown below, the Jet Spring Rider has ultraviolet protection to prevent color fading. Minimum safety use zone of 15' x 17'. The Jet Spring Rider Play Component comes standard in the colors as shown. A single spring, mounting plate, and assembly hardware is included. 15' x 17' Use Zone.